This is a nice little tour that takes you around quite a bit of the old city, with lots of interesting tales about its most important medieval families. It gives you a nice glimpse of how life was at the time and it's a great way to learn where some of the key sites are and see them when they're not surrounded by tourists. We have visited Florence before and wanted to experience a different perspective of the city. Our guide showed us places we would have not seen otherwise. The gelato we had is by far the best gelato. This place has had many rewards. Santa Maria Gelateria. Angelo A. yes, with an A gives a great tour for people who enjoy mystery, history, and humor. You start at the Palazzo Strozzi with an introduction to the power players of Florence. Angelo A is a captivating storyteller and it's easy to travel back in time with him. You'll snake through Florence with Angelo's stories of the Medicis and the rise and fall of Florence. He will show you where Florence was re-built after World War II. You won't be able to tell until you know. 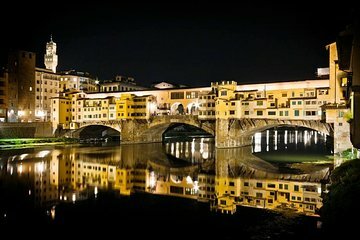 You'll cross the river and wander through the Oltranro with more stories about the legends of Florence. Angelo A. is irreverent, subversively funny, and fiercely passionate about his city. Great tour that ends with good, cheap gelato. Stephano shared his incredible knowledge of Florence. The nighttime tour was one to remember. A terrific way to see Florence and learn some of the more intriguing stories in the city's history. Our guide was excellent - knowledgeable and entertaining. Medieval Florence walking tour was great. Our tour guide knew all the ins and outs of Florence proper and kept everyone interested. She was knowledgeable and it was fun to hear her individual stories about the sights. A truly enjoyable experience led by our guide who gave a lot of information in the most compelling manner. Angelo made this tour come alive and kept us all engaged in the mysterious side of Florence! He's a great story teller with a wonderful sense of humor, going above and beyond our expectations. We appreciated the little known facts and their link to the 'great' families that established Florence as a power. We highly recommend this tour!! Interesting tour of the back streets of Florence with stories of Medici intrigue along the way and ended superbly with a ver good gelato. Tour was a little too long to do on an empty stomach. I should have had an early dinner.